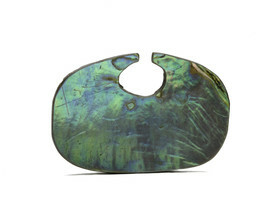 High ranking men wore abalone shell nose pendants like this one. As young boys they received nasal perforations to hold pendants or pins, while girls had their lower lips pierced for labrets. Most abalone shell (also called haliotis) was acquired in trade from coastal tribes to the south, in exchange for eulachon oil, blankets, and spoons that the Tsimshian carved from the horns of wild goats and sheep.